Curling Stones for Lego People: Rebel without Tomato Sauce! 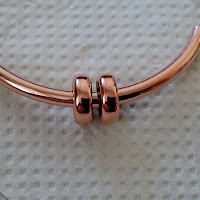 Like many others I was really intrigued, and rather excited, when Trollbeads announced they were going to release a copper version of the very popular solid silver bangle at the end of April. 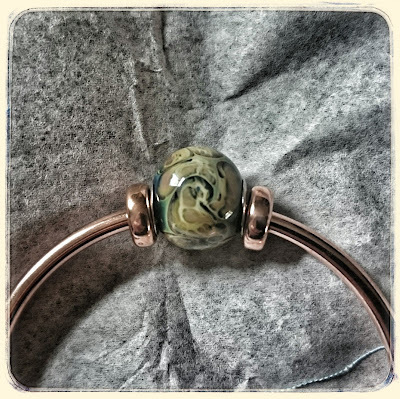 I love the use of different metals in jewellery and as I don't normally react to copper (I'm quite lucky on the metal allergy front) I couldn't wait to receive my bangle and stoppers. This is my bangle as it arrived, the background is actually the tissue paper it was wrapped in! I started wearing it straight away and Yay no reaction - not that I was expecting to have one, but it's nice to know I still don't! I've made very few changes since it arrived, I liked the copper next to the green bead so much that I've actually not swapped the bead at all; I've just added a couple of silver stoppers to the mix. One aspect I was really curious about was how it would age as there was lots of chatter on the Internet about this element of using copper in jewellery. On purpose, I've followed none of the guidelines for keeping it shiny; I've deliberately left it out all the time (ooh you rebel), just over 2 months now, so that it would get as "aged" as it possibly could. Prompted by a question on the Wednesday Twitter #Trollbeadschat (8pm GMT if you're interested?) 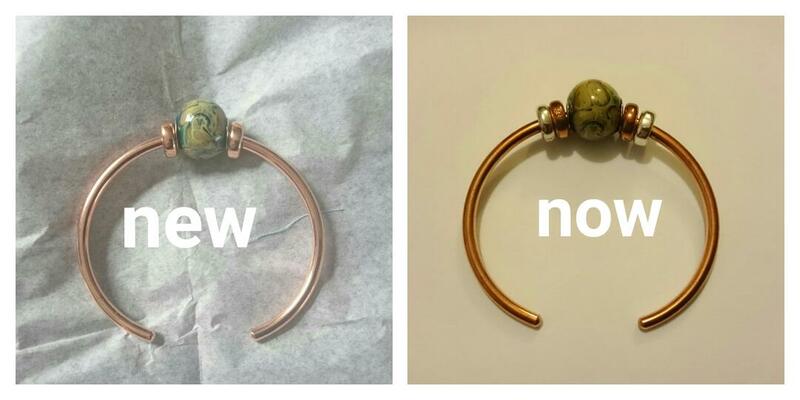 I tweeted a before and after pic of my bangle for comparison. It's gone a lovely deeper copper colour which I quite like! I left it another week but then decided it was time to try out some of the methods for cleaning it. Me, being me, didn't bother to look them up... so I tried vinegar as I had a vague recollection that was one of the possible, find it around the house, cleaning products - not so great, it was much better on my chips! Really I should have taken a pic when the bangle was half clean to show the difference... the black marks still on the bangle have actually come off the inside of my silver stoppers; I haven't been able to remove those yet! Although I forgot to take a pic of the bangle halfway through, I think this next pic might demonstrate the difference between the before and after quite well! Left: Stoppers before cleaning Right: Stoppers after cleaning! It's very simple, just put a tiny blob on some kitchen towel, rub your bangle and stoppers with it and voila! I washed them in mild soapy water afterwards to remove the food smell, dried them very thoroughly and I was good to go. Personally I'm very happy with the colour that develops over time with my bangle; for now at least though it's back to shiny! My Copper Bangle, shiny again thanks to HP Sauce! Would you wear copper jewellery and other metals? What do you currently use to clean your jewellery? Share your tips! I do wear some copper jewelry, but I think silver looks nicer against my skin-tone. I was worried it might not suit as I'm rather pale skinned... 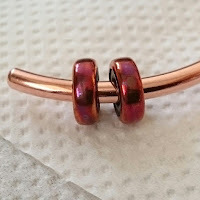 I prefer silver for the same reason, but the copper was actually more versatile than I thought colour wise. I definitely would like to get another one, but I have other things further up my wish list at the moment, oh and I've overspent this month! It looks great Mars, I love the bead you made! That cleaned it up really nicely, I don't have any Troll copper but I do have a different copper bracelet that is very tarnished, maybe I will try ketchup on it. Thanks Natalie! It works wonderfully and you don't need much at all, just a tiny blog and not much elbow grease either, I was very impressed at the results. Lol a tiny blob not blog! I don't have a copper bangle/bead/stoppers yet, but all are on my "maybe" wishlist. Other things further up the wishlist and all. I don't have any other copper jewellery items yet so I'm a little curious about whether I'd be one of the ones to react. My bronze X links have tarnished a bit, but I don't mind the look so I haven't bothered to shine them up again. I've yet to try it on my bronze but I'm going to give it a go! I wonder if it will work on silver? I have a couple of silver rings that have tarnished where I can't get into the crevices with a polishing cloth... mmmm, will stick that on my list of things to try too! Oooh I actually really like it tarnished. Beautiful rich color. :) Also love how creative you got with cleaning your bangle and stoppers. The tarnished look for me just means I get two bangles in one :) I was giggling to myself as I was doing this trying to remember what you could use but not looking it up! I really must buy some more ketchup though (for my food not my bangle), don't use it often but I do like it on bacon sandwiches! Wonderful to see the difference!! I must say I prefer the new shiny look - but as I am one of those who manages to tarnish copper within hours (my DD bought me a copper bead so I know! ), I am not sure that copper is for me. Too much effort - great shame. It took a good 2 months of "abuse" to get it that tarnished, but it did seem to speed up in the week that I looked at it and thought "time to polish" and when I actually came to do it... or maybe it's perception in that I was looking at it more closely! I'm glad I can wear copper, after saying I'm usually fine with all metals I tried on a cutlery ring on Sunday and got it stuck briefly (it felt a lot longer), finger was more red that I expected it to be so I'm not sure if I might have had a reaction to the ring, or something that was on it. Thought I was going to have to buy it just so I could go to a food outlet to get some oil or butter!! I think sculputral silver beads inlaid with copper would look lovely, something that doesn't touch the skin directly, have to say my plumber was really surprised when we redid the heating that I wasn't one of these people who wanted all the pipes covering or painting... told him how much I loved the look of copper and only painted pipes that were already painted! He said I was a plumber's dream... lol!